There are a lot of things that sheet metal can be used for. Sheet metal can be installed on just about any surface to help support framework and can be used for roofing material to help keep out the elements. The people who install these pieces of sheet metal are called sheet metal workers. Sheet metal workers are people that help build other structures for people who have need of them. 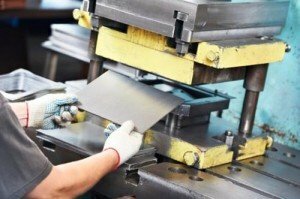 Here are the steps that you will need to know in order to become a sheet metal worker. The process to become a sheet metal worker starts with completing your high school education. You will want to focus on taking classes dealing with English, geometry, algebra, mechanical drawing, physics, reading blueprints and just shops classes. Once you have graduated high school you will want to enroll in a tech school or community college to get the classes that you are lacking. While you are finishing your education you will want to start the process of the apprenticeship that is required to become a sheet metal worker. The apprenticeship can last for up to 5 years. You may also have to go through nearly 2,000 hours of training. You will end up learning how to fine tune your skills that you learned while in school. Some of the apprenticeships can be found through a local union or a business that is hiring sheet metal workers. You will have to check with each source as to the enrollment requirements. You may also want to think about getting any certifications that are offered to sheet metal workers. People looking to hire a sheet metal worker will be looking for those who stand out from the crowd. Sheet metal workers have to use equipment that helps them cut certain cuts. These devices are computer driven devices so you will want to know how to use basic computer devices. As a worker you will end up being the front to the company that you work for so take the time to develop a sales minded outlook on your profession. Be willing to answer the questions that people may have as you finish a job that they hired you to do. You will also have to be able to use certain specialty tools so a basic knowledge of how to use the tools is a must. You must also be able to lift heavy pieces of equipment. Most of the sheet metal that you will be dealing with is large and heavy. Knowing how to lift correctly and safely will go along ways to making you a successful sheet metal worker. Sheet metal workers enjoy a median salary of $41,710 per year which averages out to around $20.05 per hour. Pay varies by job market but overall has a strong average. You will have to install metal paneling around items such as heaters and air ducts. In some cases you may have to install wall pieces and even work on a roof. Your work environment will vary by job site. You may have to work in small spaces or outside for a period of time. You will have to work standing up and even bending down. You will also have to work in areas that may require you to lay on the ground. You can expect to have to use the tools are your disposal in a small work area. So it is imperative for you to know you tools and what they can do.